* The text below is a slightly edited version of Andrew Weil's comments at the award ceremony on Friday, June 1st 2018. Se t back from the street on Tower Grove Avenue a few blocks north of Manchester is a modest brick townhouse that is a remnant of the earliest phase of residential development in Forest Park Southeast. More research is needed, but we do know that at the turn of the century, this was the residence of pioneering African American educator Oscar M. Waring. Waring was born in Pennsylvania in 1841. He attended Oberlin College in Ohio where he learned to speak Greek, Latin, Italian, French, and Spanish. Following the Civil War, he worked for the Freedmen’s bureau teaching former slaves how to read. He then earned a law degree, briefly taught mathematics at Alcorn College in Mississippi, and then moved to St. Louis in 1877 where he became one of the first African American teachers in the SLPS and in 1879 became the first African American Principal, serving at Sumner High School. For decades this home was used as a homeless shelter by New Life Evangelistic Center and as transitional housing by agape House Outreach Center. The home was purchased by Timothy Greenwald in 2016. At that point, very few original details of the home were visible, but they weren’t completely gone. Faux wood paneling and drop ceilings obscured original wall surfaces and room volumes. Spaces had been subdivided, windows boarded, and the exterior neglected. Original features like paneling and balustrade were uncovered during the renovation process. The rear wall had to be taken down and rebuilt and the masonry detailing of the parapet had to be restored and all windows were replaced with custom historic replicas. 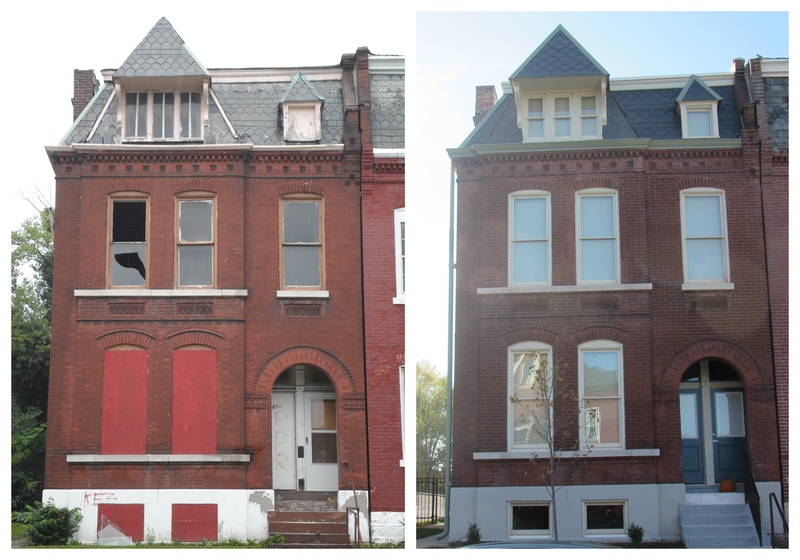 Thanks to the hard work and skill of owner Tim Greenwald, contractor Millennium Restoration, and architect Killeen Studios, 1211 Tower Grove survives as a beautiful example of the early days of Forest Park Southeast and maintains a connection to an important figure in the history of St. Louis. Most Enhanced Winner #2: 2000 Washington, Brick River Cider Co. Built in 1892, this fire house was constructed to protect the busy Washington Avenue wholesale and light manufacturing district from the ever present risk of catastrophic fire. The need for fire protection in this area was such that an additional fire house was built on the south side of the building in 1919. 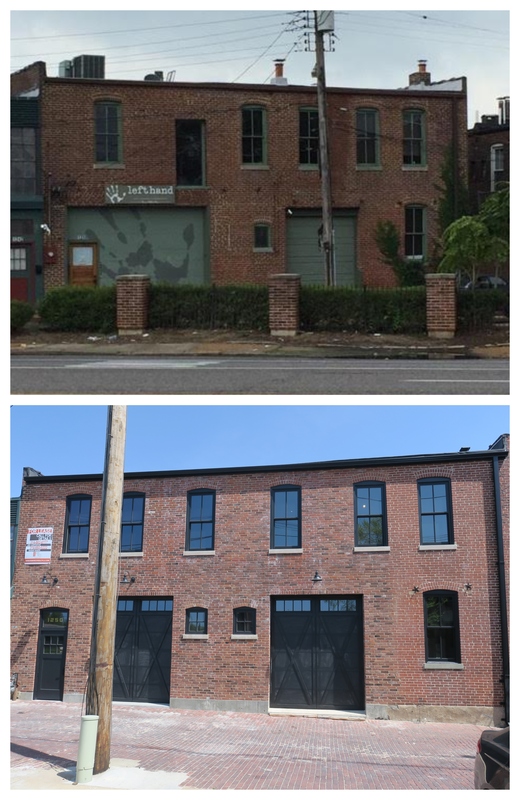 Owner Russ John, with design and contracting assistance from Blackline set about restoring and converting the building into St. Louis’ first Cider Brewery. The building had been turned into a fortress in the 20th century with bricked in windows, doors and glass block dominating the first floor. Lake Superior sandstone was melting off the primary elevation and an office with a drop ceiling and furred out walls anchored to the glazed brick interior had to be addressed. Remarkable historic ceilings were restored, windows and doors unbricked, a new staircase, elevator, restrooms and a full commercial kitchen were added to serve dining and tasting rooms and, of course, a major cider production and distribution facility was installed. The owner’s family traces roots back to St. Louis where his great grandfather enlisted in the Union Cavalry at Jefferson Barracks during the Civil War. He later established a farmstead with orchards in southeastern Nebraska that is still in the family and from where Brick River will be sourcing increasing amounts of raw material. Brick River is a fabulous addition to the west side of downtown and represents a major investment in a unique historic building as well as the manufacturing operation to open on Washington Avenue in recent memory. Blackline Design + Construction was the architect and contractor. Karen Bode Baxter was the Preservation consultant. Constructed as a factory and retail space for the Rice-O’Neill Shoe Company, and later known as the Gordon Buell Building, rehabilitation of this 69,000 square foot building was about to get started in early 2016 when a four alarm fire erupted through the second floor and roof. Damage was so extensive that we fully expected demolition and a huge new vacant lot along this important western stretch of Washington Avenue, but a spokesman for the building’s owner, quickly announced that the building would be salvaged. Amazingly, the brick and terra cotta façade remained intact as did much of its steel structural system. Just over two years later, it’s amazing to see what can happen when a developer is truly committed to historic rehabilitation. Today the building, now known as the Beatrice Lofts, contains 36 apartments surrounding a unique open air courtyard as well as street front retail along Washington Avenue. Thanks to the heroic efforts of owner 1900 Washington Partners, architect/contractor Blackline as well as the architectural services of Ebersoldt + Associates, this building, which so easily could have been discarded, continues to make a major contribution to the urban fabric of St. Louis’ most iconic street. This building was constructed prior to 1892 as the stables for the Piskulic Monument Company. It’s one of six buildings that remain from this company, founded by Croatian immigrants in the late 19th century and operated at this location on the edge of Soulard until 1969. In 2017 a large tractor trailer crashed into the building. The City was swift to condemn the building. Owners Kevin Garber and Kathy Bosin called Fendler & Associates who in turn got in touch with masonry contractor The Harlan Company, and they set to work rebuilding. Today, the façade of the stable has actually been returned to a more accurate historical configuration than it was before. Despite being located in one of the city’s premier historic districts, the condition of this building could have easily justified an emergency demolition, but thanks to the value the owners placed on preservation and the abilities of the Fendler and Harlan teams, the Piskulic Monument complex remains intact. Owners are Kevin Garber and Kathy Bosin, project architect was Jennifer Sims Taylor with Fendler & Associates, the Harlan Company was the masonry contractor, and Kevin Kelleher consulted. Originally known as the Gerhart Block after its developer the Gerhart Realty Company, which constructed this unique Chateauesque building in 1896. With storefronts on the first floor and apartments above, the block thrived for decades at the corner of two streetcar lines along Vandeventer and Laclede. In the early years, the block was like a town unto itself with a drug store, physician, dentist, saloon, grocer, butcher, barber, cigar store, and restaurant among others renting space. In the early 20th century, the neighborhood became increasingly industrial and a lot of the homes and the businesses that catered to them were replaced by factories and buildings related to the auto industry, leaving the Gerhart block as an unusually stylish survival. For the last 30 years, the building has been mostly vacant. 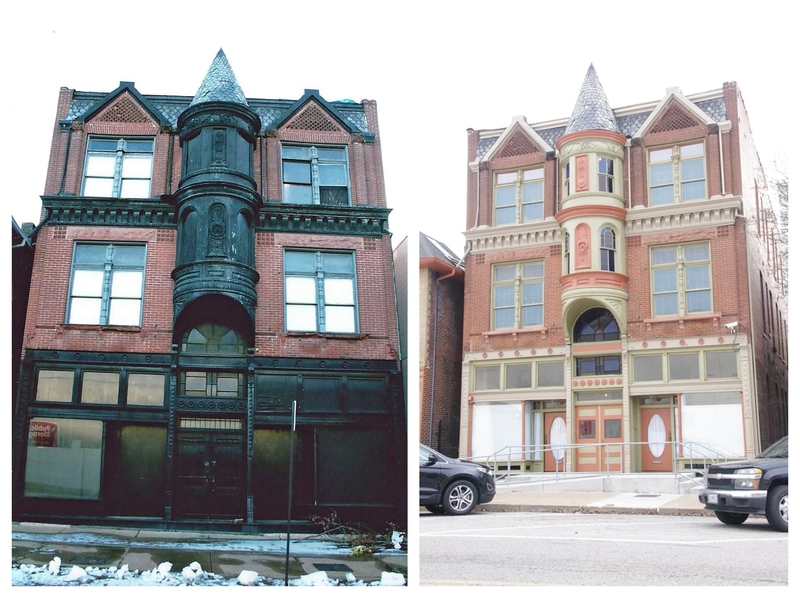 In 2003, Landmarks Association listed the property in the National Register, clearing the way for the use of rehabilitation tax credits, but redevelopment still remained elusive for 13 more years. Finally with the growth of Cortex and other central corridor success stories, Capstone Development saw an opportunity in the building, but first it would need to be restored. Ten million dollars later, the building boasts 17 luxury apartments, 10 commercial spaces, and a wealth of restored original materials. This project displayed an exceptional attention to detail, even taking the time to replicate the missing owl that had been stolen from the top of one of its turrets. 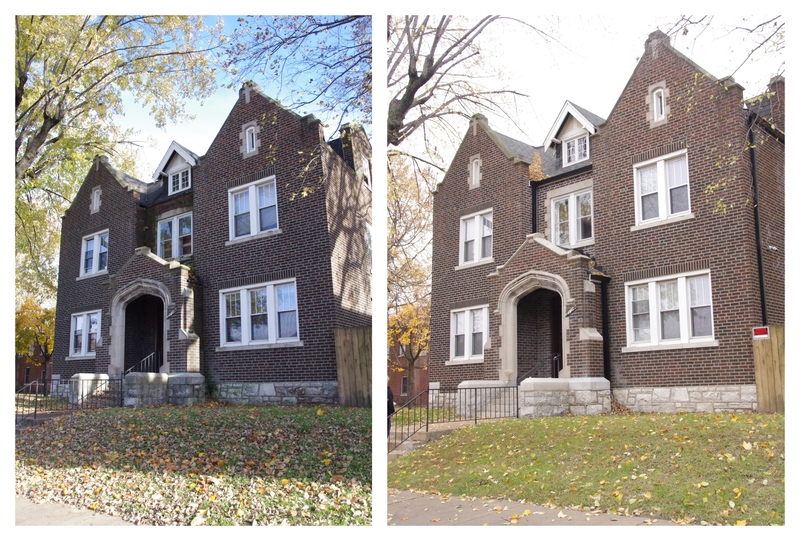 Thanks to Capstone Development, Cohen Hilberry Architects, and contractor Crestwood Building Associates, this unique and beautiful building is making a huge contribution to the restoration of an urban environment in the booming corridor between Grand Center and the Central West End. 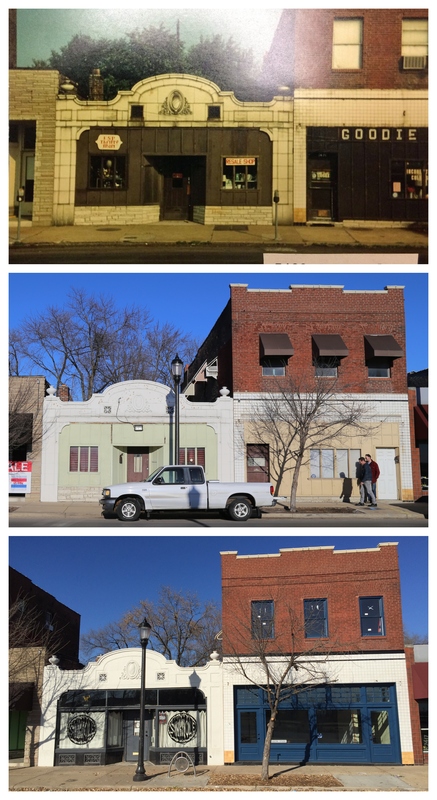 Most recently the home of First Call Plumbing and Remodeling, this building was in need of a new life. Plumbing and electrical infrastructure needed to be installed below the slab. The primary elevation was defined by broken and boarded windows above permastone clad bulkheads; the interior was dim with blinded bays and a flat ceiling with dark, exposed rafters. The rehabilitation cleaned and repaired the exterior, which once again allowed the unusual, Depression Era deco design with its attractive basket weave bond panels, string courses and honey colored terra cotta coping to beautify the neighborhood. The storefronts were opened and restored, which, coupled with a new clerestory, flood the building with natural light. Rafters removed to accommodate this alteration were reused as wall treatments and a modern, free-flowing office environment built into the spacious open floor plan. One of the great things about historic areas is the mix of commercial, residential, and institutional spaces that allow for the development of unique neighborhood identities. But a persistent challenge is finding businesses to occupy the corner storefronts of yesterday. 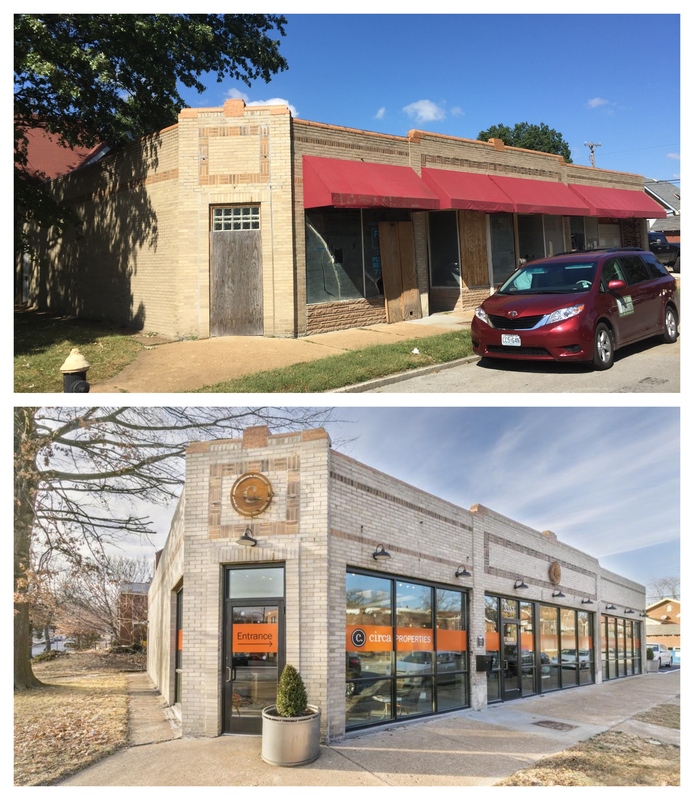 Fortunately for Tower Grove South, another one of its great little commercial intersections has one less building to worry about thanks to Circa Properties, which relocated its office here from Webster Groves. The architect was Killeen Studio and the contractor was Grand Home Solutions. This little shotgun home is typical of the working class residences that occupied the Forest Park Southeast area when it was dominated by heavy industry at the turn of the 20th century. These are exciting times in the Grove with a very hot real estate market and significant new buildings being announced on a fairly regular basis, but this was not the case nearly twenty years ago when Guy Slay and his company Mangrove Redevelopment first started working in the area. Most of the buildings were in the same condition as the little brick house at 4225 Swan. Vacant for at least a decade, the coping tiles along the parapet had been removed to compliment the already theoretical roof. Despite these, and many other challenges, enough original millwork remained for the purposes of replication, significant portions of the floors were salvageable, the hearth was uncovered and restored, sodden plaster and drywall gutted out, original window dimensions reopened and a beautiful and tidy home reemerged. Today’s hip neighborhood is the result of decades of steady work like this. Through it all, Mangrove has been guided by a long term vision for what the area could offer to new residents, while ensuring that current residents were able to come along for the ride. While more expensive new buildings offer luxury living, and large new single family homes are carved from historic multi-family buildings, the neighborhood’s little shotgun homes have much to offer at a price that is accessible to a wider audience. Such homes help the neighborhood to remain true to its roots and ensure that The Grove really does have something for everyone. Project Architect was St. Louis Design Alliance, Mangrove Redevelopment was the developer and contractor, Karen Bode Baxter was the historic preservation consultant. This is exactly the type of redevelopment project that we hoped to see when Landmarks Association created the Central Carondelet National Register district in 2006. South Broadway has enormous potential to once again become a major commercial and entertainment district for the City and it’s great to see people investing in the area. Originally built as John Duggan’s horse-shoeing shop and stable around 1887, the terra cotta façade and Mission style parapet of this building were added in 1905. Like the other main street shopping districts of St. Louis, South Broadway declined as a commercial area with the rise of the shopping mall. By the 1990s, most of the businesses in this area were closed, or underutilized as South Broadway awaited a new renaissance. One of St. Louis’ great strengths is the accessibility of interesting historic buildings for creative people who want to take chances. In this case, a former stable, owned by a furniture designer, has been reinvented as a bar, recording studio and concert venue, by a partnership of musicians, a music booker, and a sound engineer. The articles I’ve read about the Sinkhole indicate that these guys have tried to create a relaxed and unpretentious venue, yet great attention to detail went into the restoration of the historic terra cotta façade and storefront windows as well as the restoration of historic floors, glazed brick walls, the installation of new systems, a bar, and a soundproof recording studio. 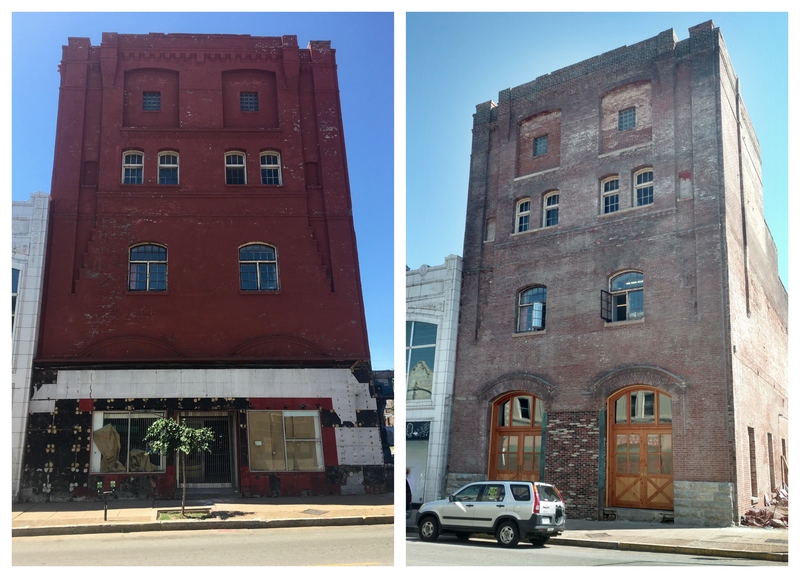 The building next door at 7421 was restored at the same time, and now both are contributing toward the critical mass of activity and investment that is heralding a new chapter and new identity for South Broadway in Carondelet. Project Architect was Killeen Studio, Keplinger Construction was the contractor on The Sinkhole. Constructed in 1925 as a convent for the nuns who taught at St. Boniface school, in more recent years the building had been used as a residential care facility, which closed and left the property vacant in 2010. At that point, the vandals and the water infiltration set to work. When new owners Chris and Elizabeth Vancil acquired the property, the gutters, fascia and trim had been vandalized, allowing water to run off the roof and into the masonry causing extensive mold as well as damage to interior plaster walls, ceilings, and bringing some walls near to the point of collapse. Still most original wood windows survived in repairable condition and those that were missing were replaced with custom milled replicas. The deteriorated deck in the rear was rebuilt to allow wheelchair access to the back yard, a new commercial kitchen, new mechanical and sprinkler systems were installed, wiring and plumbing replaced, the original wood floors, wood trim and stairs were restored as were built in cabinets. Today the building is once again serving as an assisted living facility. Its original character has been revealed and it is contributing a beautiful and stabilizing presence to the vicinity of the Ivory Triangle in Carondelet, which is one of the most unique corners of the City. The owner and developer was CEDA Properties, architect was Randall Spurr, Contractor was George Mahoney, and historic preservation consultant was Karen Bode Baxter. Constructed in three phases between 1882 and 1919, Gratiot School is an unusual surviving example of a St. Louis Public School that was originally a rural school house. Closed in 2010 and vacant for five years before being acquired by Garcia Development for conversion to market rate housing, the school could easily have fallen prey to the scourges of vandalism and decay that have wreaked havoc on far too many of the city’s decommissioned school buildings. The Garcias had been watching the property and thinking about how it could be reused since they started operating in the area in 1998. Structurally the building was in decent shape, and classrooms of 600-800 square feet, with high ceilings and window openings lent themselves well to residential conversion. The school was small though with wide hallways and no attached gym or ancillary buildings to add rentable space. 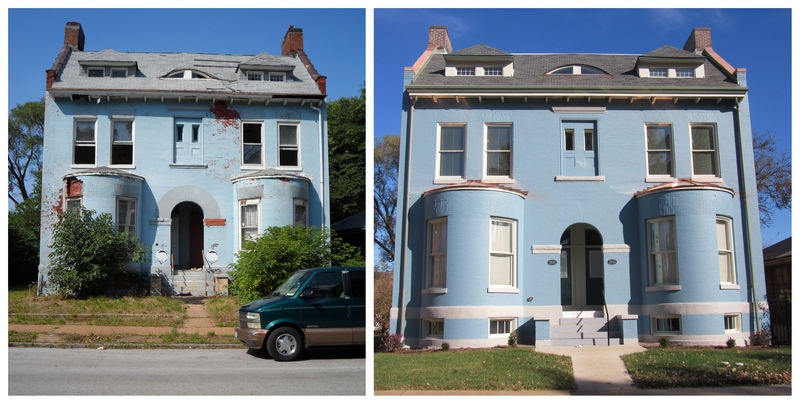 This made feasibility challenging, but not impossible with the assistance of historic rehab tax credits. A particularly difficult aspect of the project was the fact that each of the three different sections had different historic windows that had to be restored and replicated to the satisfaction of the NPS reviewers. Fully leased almost immediately, the conversion of Gratiot School shows what can happen when the SLPS is able to move quickly to match up excess capacity school buildings with experienced developers. Project architect was Paul Dehart with preservation consulting services from Melinda Stewart. Garcia Properties Development was both the contractor and developer. One of William Ittner’s first designs as architect for the St. Louis Public Schools in 1898, Sherman School served the Shaw neighborhood for 115 years before being closed in 2013. 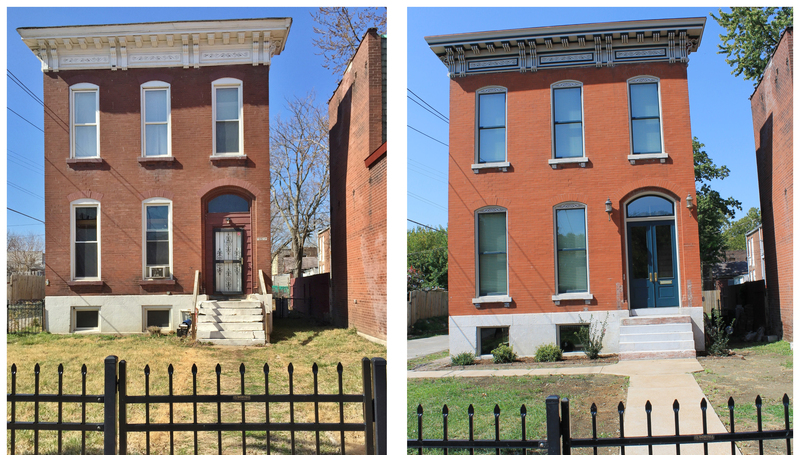 In 2015, it was sold along with Lafayette School in Soulard to Advantes Development for conversion into housing. Advantes received a Most Enhanced Award in 2017 for their completion of the Lafayette Lofts, and for their second act, they have salvaged this other Ittner treasure. 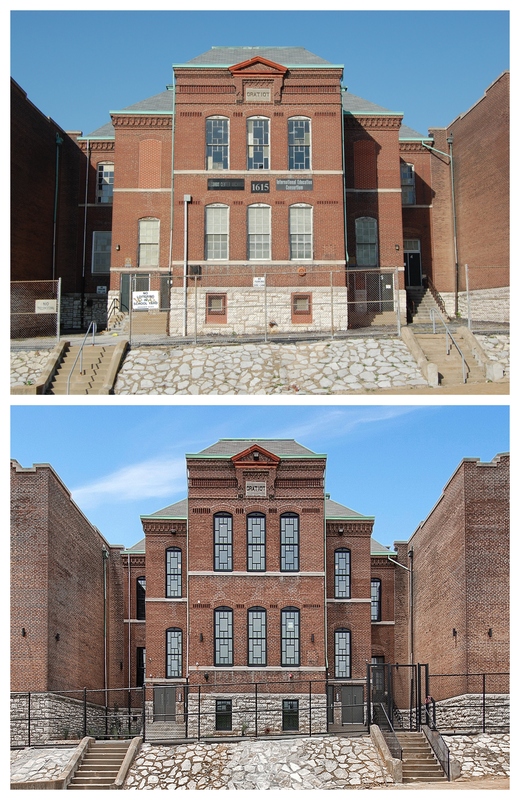 Fortunately, Sherman had avoided the kind of serious vandalism that has victimized too many other empty school buildings, but it still required a mammoth effort to retool and reconfigure for residential use. Most developers that have accepted the challenge of saving one of the City schools, state such projects are simply not feasible without the historic rehabilitation tax credit plugging the financial gap. Project architect was Mark Gettemeyer of M2Architecture Studio, and Advantes Development which served as contractor and developer. Deep beneath Cherokee Street are the once debris filled vaults of laagering cellars beneath the former Cherokee Brewery Stock House. Earthbound Brewing decided to relocate down the street to this historic venue. The exterior was completely restored based on historic images and careful reproduction. The world’s largest drop ceiling was removed from the former convenience store space to make room for a jaw dropping tasting room, and the 150 year old lagering cellars were excavated, revealing a piece of St. Louis’ living history that is utterly unique. The magnitude of the latter achievement cannot be overstated. When the adjacent brewery buildings were demolished nearly a century ago, they were simply dumped into these chambers. The team behind this rehab [Nathan Dirnberger and Earthbound co-owners, Rebecca Schranz, Robin Johnson, Jeff Siddons, and Stuart Keating] removed this debris, 1.2 million pounds of fill, by HAND using picks, shovels and wheel barrows. This project is emblematic of the kind of grit, vision, skill and enthusiasm that pervades the Cherokee Street community these days and has already become a legend in its own time. The project architect and contractor was Nathan Dirnberger, building owner is Will Liebermann, and preservation consultant was Melinda Stewart. Constructed in 1915 as the Shaw Place Theater, the building was originally a neighborhood movie house with seating capacity of over 1,100 people. Perhaps wanting to capitalize on all the cavities and broken bridgework originating with the snack bar, a dentist set up his practice in the apartment above the marquee. When the theater first opened, patrons came to see silent films by the likes of Charlie Chaplin. When it closed, “The Bridge on the River Kwai and Old Yeller” were among the season’s biggest hits. Later on a drugstore operated here, followed most recently by the Salama Market. By the time the building was identified as a redevelopment priority by the surrounding neighborhood, the storefronts had been largely boarded and most of the interior was defined by mold, water damage, and a quantity of random debris and trash that can only be attributed to a first ballot, hall of fame hoarder. 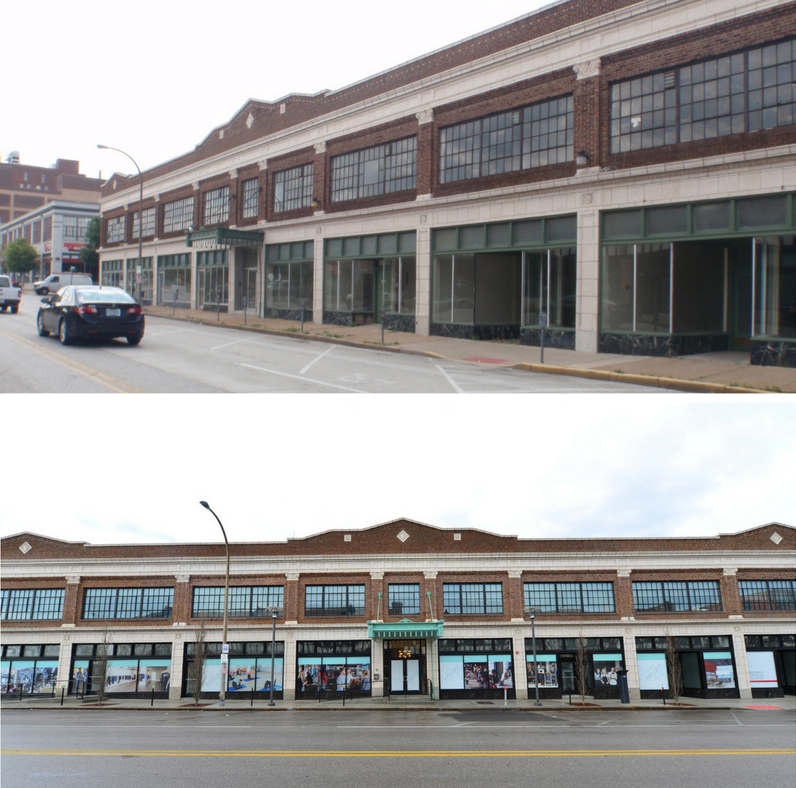 Together the Community Development Agency, Alderman Conway, and the Tower Grove Neighborhoods Community Development Corporation worked to find a use for this intimidating albatross of a building at one of the most prominent intersections in the neighborhood. Dr. Barry Newell and Laura Bunch of Newell Post LLC accepted the challenge with a vision for an event space that would return crowds to the historic theater. Partnering with Urban Improvement Company as contractor and the Central Design Office as architect, owner-operators Laura and Casey Bunch opened the doors to Wild Carrot in late May of 2018. This amazing collaborative, multi-site effort grew out of a need recognized by Messiah Lutheran Church for more safe and affordable housing in its surrounding neighborhood. In particular, the church wanted to help refugee families who had joined the congregation, but who were having difficulty finding housing in the vicinity. The resulting project brought together RISE Community Development with the Messiah congregation, Lutheran Development Group, and a diverse array of community partners including Landmarks’ Revolving Loan fund, to rehabilitate 12 of the most deteriorated buildings in the Fox Park, Tower Grove East, and St. Francis DeSales Historic Districts. Through the careful restoration of these beautiful, but neglected buildings, forty seven unique apartments of various sizes and rents have been added to these great historic neighborhoods, and Messiah’s immigrant refugee families have better access to their adopted community and the services they need. Congratulations to everyone involved in this truly inspirational project. E. M. Harris Construction was the contractor, Rob Wagstaff with Urban Werks was the architect, and the owner was Lutheran Development Group.